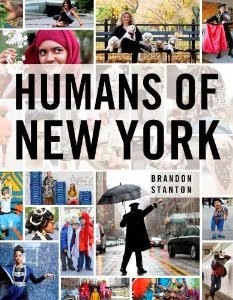 Home » books » new york » review » Book Review: Brandon Stanton's "Humans of New York"
I've no doubt that many of you have become hooked on the wonderful photography project by Brandon Stanton, Humans of New York. I think I was first introduced having seen a number of friends sharing his wonderful photos of New Yorkers on Facebook. From there, I liked the page and have been perusing his stunning images ever since. When I heard that he'd compiled a hardback book of a selection of the photographs, I knew I had to own it and luckily for me it was gifted to me last week for my birthday. I was soon pouring over the pages, marveling at the vivid colours and the variety of people on display. Brandon writes a bit in his introduction about how he found his way to the Humans of New York project on something of a whim. Having lost his stable job, he decided he wanted to hot foot it across the States taking pictures. When he arrived in New York he was astounded by the sheer number of people and soon began photographing them. This made me appreciate the book even more as it was born out of someone's true passion for photographing people. Part of the appeal of this book has to be the captions and brief anecdotes that appear alongside many of the photographs. From the youngster who was adopted by a high school teacher to the drunk man on the street, Brendon's pictures capture people from all walks of life. There is a sense of an inclusive community in his photographs, one in which everyone can be the subject of art. I like that. What's more, the pictures seem to capture New York in all seasons, from Spring in the parks, to Winter on the traffic congested streets. As long time readers will note I have a particular fondness for this energetic city and the book rekindled my passion. If I had to pinpoint what I enjoyed most about the book (and the website) it would have to be the way in which each photograph captures an instant in a person's life. Sometimes that is a moment of joy or contentment, but often it's an entirely ordinary moment in their day. These apparently insignificant moments are immortalised through this project creating a celebration of everyday humanity. To me, that's what makes these pictures so special. By far the best money I have spent on any book in the past few years. I recommend the Humans Of New York Stories to anyone and everyone. In fact, it will be the go to Christmas gift for my family this year. Elegant, original and pure, this book represents humanity at its most candid and lovable.